Former Senate Minority Leader Gretchen Whitmer has been attacked by her Democratic rivals Abdul El-Sayed and Shri Thanedar for benefitting from the political nonprofit Build a Better Michigan. Earlier this month, she pointed the finger back at El-Sayed and said he’d received $170,000 in donations from corporate executives. 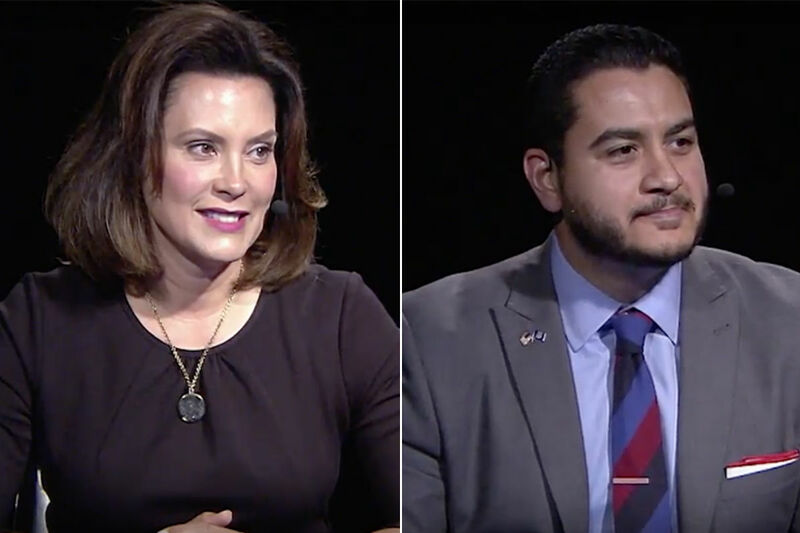 A long-standing source of tension between gubernatorial candidates Abdul El-Sayed and Gretchen Whitmer — corporate donations — boiled over during the final Democratic gubernatorial debate before the Aug. 7 primary. Zack Pohl, Whitmer’s spokesman, defended her statement. We rate her claim mostly inaccurate because it is misleading. Whitmer’s campaign offered a list of almost 150 contributions made to El-Sayed’s campaign by people sporting an executive-level title such as CEO, COO or “director” in 2017 (the last campaign finance reporting period available before that debate.) Together, those donations totaled nearly $200,000. The leader of a mom-and-pop business and a large corporation might both be dubbed “CEO,” and that breadth is reflected in the list: It includes donations from the CEO of men’s clothing company Bonobos and a vice president at Amazon as well as the leaders of a variety of small-to-mid-sized nonprofits. But that doesn’t tell the whole story. Experts say it’s a false equivalency to compare individual donations from executives to donations from corporations. “There’s a difference between an individual giving money based on individual interest and a corporate PAC that’s giving money to advance the interests of a corporation,” said Craig Mauger, executive director of the Michigan Campaign Finance Network. The El-Sayed campaign made a similar argument. “This seems contrived and meant to confuse voters,” spokesman Adam Joseph wrote in an email, adding that donations from executives at small nonprofits would not sway El-Sayed’s decision-making as governor. Build a Better Michigan — the political group that has issued an ad featuring Whitmer and is often the focus of ire from the El-Sayed camp — can raise and spend unlimited amounts of money (including from corporations) under federal law, while individuals can only donate up to $6,800 to a campaign under state law. According to its federal filing, Build a Better Michigan has raised $2.2 million. Many of the group’s donors are labor groups and individuals, but more than half a million dollars came from groups that state campaign finance experts say are not required to disclose where they got their money: Progressive Advocacy Trust and the Philip A. Hart Democratic Club. While Build a Better Michigan is legally independent of the Whitmer campaign and cannot explicitly endorse her, it is headed by her former chief of staff and has paid for a television ad that Whitmer narrates and which highlights her legislative history. Its significantly larger fundraising capacity makes a comparison with individual donations moot, experts say. “It is not the same to be working hand in glove with an (organization) that can take unlimited funds as it is to be accepting donations from anyone that is subject to some sort of contribution limits,” said Daniel Weiner, an expert in campaign finance at the Brennan Center for Justice at the New York University School of Law. Experts acknowledge that definition is a gray area and often a moniker loaded with political subtext. The El-Sayed campaign has indeed received more than $170,000 in donations from people with executive level titles, including some who work for large, national or multinational companies. But those donations are limited and individualized, and can’t be reasonably compared with the unlimited donations possible through nonprofit political groups such as Build a Better Michigan, according to campaign finance experts. Craig Mauger, Michigan Campaign Finance Network: “There’s a difference between an individual giving money based on individual interest and a corporate PAC that’s giving money to advance the interests of a corporation.” Wrong. In practice, donors who make a point of stating their title and employer are trying to influence candidates to further the employer's agenda. This was SOP at Dow Chemical. Dow donated an amount, then its executives sweetened the pot with personal donations, and made sure the candidate knew those were coming from Dow executives. The goal was to influence the candidate to favor Dow positions on issues. When you donate, the law requires that you identify your employer and your job title. The behavior of Dow is interesting, but irrelevant. Any businesses affiliated with folks who donated to Mr. El Sayed's campaign didn't donate to his campaign, because he isn't accepting PAC money or corporate donations. Vote El-Sayed on August 7th!